Sharad A Vaze & Co.
Sharad A. Vaze & Co. is a 30 year old Chartered Accountancy firm providing outstanding solutions in chosen practice areas. We are an unique blend of expertise, bringing together vast industry experience of 30 years and privilege of personal attention and responsiveness of a small firm. Our main emphasis is on ethics and accountability strengthening client's trust, prospects and growth. Our organisation is a mix of young and senior highly experienced professionals known in the industry for personal attention, technical depth and quality services provided in the Audit, Tax regulatory and litigation area. Sharad is a Fellow Member of the Institute of Chartered Accountants of India and Law graduate with more than 33 years of consulting experience in direct tax and regulatory matters. He has significant experience in advising domestic and foreign companies on various aspects of taxation, transfer pricing, inbound investments and exit strategies. He also has vast experience in representing clients before Income Tax Appellate Tribunal and handling complex tax litigation. He has also represented as Counsel on behalf of Chartered Accountants before the Disciplinary Committee and the Council of the ICAI. 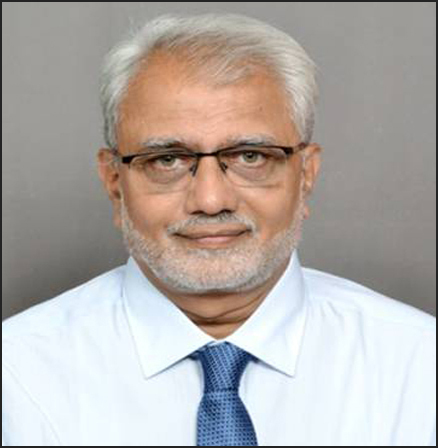 Sharad is a part-time professor in BMCC, University of Pune since 1982 and a visiting tax faculty at National Insurance Academy (NIA) and National Institute of Bank Management (NIBM). He is a regular speaker at various forums and has contributed several articles in professional journals and newspapers. Janhavi is an Associate Member of the Institute of Chartered Accountants of India having more than 4 years of experience in indirect tax and compliance matters. 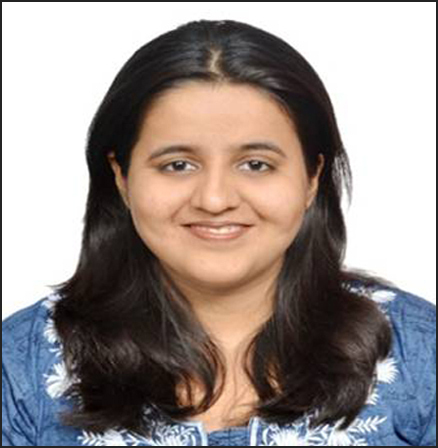 Prior to joining Sharad A Vaze & Co., Janhavi worked with Dell Inc. and BDO India in Indirect Tax. Her areas of proficiency include Service tax, multi-state VAT, Customs, etc. She has also been part of GST implementation committee in Dell. Ongoing pressures to optimize business performance have prompted many business executives tolook for new approaches, including outsourcing of the finance & accounting function. Our F&A Outsourcing Solution is perfectly suited to help your company transform into a high-performance organization that streamlines processes, maintains compliance and cuts costs, all while letting you focus on your core competencies and grow your business. We work in partnership with you to produce management information dashboards that best suits the needs of your business and your management team. Taxation matters related to inbound and outbound investments, tax incentives, merger, demerger, restructuring of family holdings, due- diligence, etc. In today’s dynamic world, organizations need to be agile. There is a need to ensure compliance with tax and regulatory requirements, while simultaneously adding value to stakeholders. At Sharad A Vaze & Co., we offer our clients a broad range of tax services which combine expertise and industry knowledge to help your businesses remain tax compliant. We view tax strategy as an integral part of your business strategy and are focused on ensuring that the tax function supports and contributes to achieving your business objectives.Our emphasis on innovation and delivery helps clients enhance value for shareholders and stakeholders alike. Dispute resolution mechanisms including advance Rulings, Mutual agreement procedure, etc. We provide accounting advisory services to support our clients in managing the accounting complexity and change that comes from the adoption of complex new accounting standards and GAAP conversions. In today’s financial reporting environment, greater scrutiny is now given to financial reporting by regulators, investors and other stakeholders. 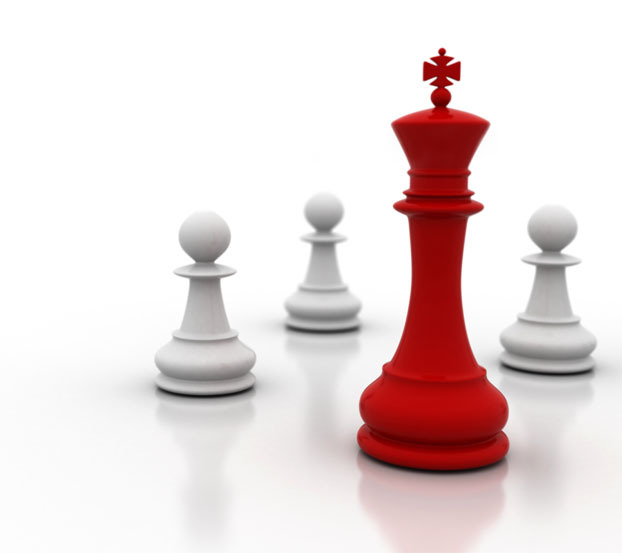 Our Accounting advisory specialists and strategic partners can support you. Our key strength is the wealth of experience we have in helping our clients manage these complex events. Indirect tax compliance for Excise, Multistate VAT, Service Tax, Customs incl. SEZ/EOU compliance. Assistance for availing benefits of various incentive schemes under Indian FTP. Indirect taxes have a direct impact on the pricing of products and services, requiring organizations to analyse and determine the applicability of various indirect taxes to their products, processes and services. At Sharad A Vaze & Co., we offer comprehensive indirect tax compliance, advisory, and operational support. Our indirect tax advisory service offering includes reviews and health checks, due diligences, determination of applicable taxes and availability of tax benefits / exemptions, review of contracts, advising on tax optimal structures for contracts, analysis of applicability of schemes in the Foreign Trade Policy, etc. In today’s dynamic and competitive business environment, business organizations of all sizes can be effective and achieve success only with effective and lean finance function. Designing and implementing strategic plans, breaking them down into annual operating plans and analysing Plan Vs Actual as well as designing and developing improved business processes require highly experienced professionals to deliver speedy solutions. At Sharad A Vaze & Co.,we recognize that in order to achieve a lean finance function, companies need support to deliver finance excellence including setting up systems for Accounting and Controls, Benchmarking, Cost Optimization and standardizing Processes. Audit under Companies Act, Income Tax Act, and other Indian statutory law. •	Audit under Companies Act, Income Tax Act, and other Indian statutory law. •	Incorporation of new companies and Limited Liability Partnerships (LLP) in India and abroad. •	Advisory services on corporate laws, SEBI, FEMA and other allied laws. •	Advisory services on company formation and determining the optimum organization structure for your business. GST is the biggest tax reform in the history of India which is set to be a game changer for all the segments of the economy. It seeks to simplify and harmonise current Indirect tax system by subsuming existing indirect taxes such as Excise, Service Tax and state VAT removing cascading effect of taxes on goods and services that manufacturers, service providers and consumers have been enduring for decades. At the same time, GST will increase compliance multiple folds for the entities having presence in more than one states. Business entities need to have a structured approach while migrating from current Indirect tax structure to the new GST regime. 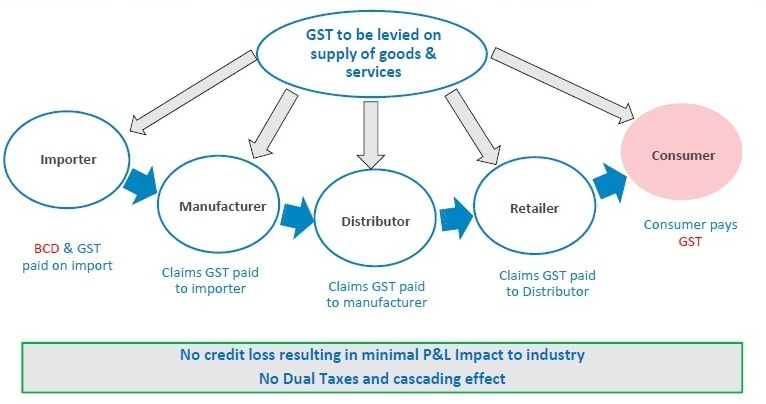 o	Mapping of current scenario and assessment of potential GST impact on different business functions and verticals. o	Drawing implementation plan to zero down on operation model, monitoring key changes such as negotiation with various stakeholders such as suppliers, logistic partners, etc., implementation of IT and mapping Standard Operating processes (SOPs), reorganisation of internal tax functions, training to staff, etc. o	Refining implementation plan post final GST Law and Rules. o	Testing and updating ERP system or Accounting Software to sail through cut-off date transactions like pre-GST input credit and migration-related issues. o	Review of contracts for consolidation of warehouses, procurement, distribution and revision in Tax clauses of long term contracts. o	Revision of Tax compliance function, designing of statutory records template, tax manuals, compliance schedulers, etc. as well as process mapping as per revised Standard Operating processes (SOPs). o	Mapping and reconfiguring with sensitive changes into product pricing, logistics cost, input credit analysis and key performance indicators, etc. o	Training to the staff, changes in the internal tax function, deployment of GST Trained staff for short/long term purpose. We at Sharad A Vaze & Co. are happy to welcome Article Assistants, Accountancy and Tax professionals who wish to associate with our Firm in its diverse practice areas. We have created an environment where professional expertise is developed and teamwork and excellence is valued at its most. To learn more about available opportunities of associating with our firm, please write to us at casharad@sharadvaze.in. Applicants should send their application at janhavi@sharadvaze.in. Application not accompanied by the prescribed documents will not be entertained. The applicant will be informed via email of the Firms decision generally within One week from the date of application. A long awaited 122nd constitutional (amendment) Bill, 2014 was passed by Rajya Sabha and Lok Sabha, making way to Goods and Service Tax [GST] - India's mega tax reform ever. GST will create a single, unified Indian market to make economy stronger, boost foreign investment and "make in India" initiative. Harmonization of laws and procedure between Centre and States. On 14th June 2016, Government has released model draft GST law in public domain for comments and discussion. Karve Road, Pune - 411052, MH India. Sharad A Vaze & Co. is a 30 year old Chartered Accountancy firm providing outstanding solutions in chosen practice areas. © 2016 Sharad A Vaze & Co. All Rights Reserved. Powered By Tinfosystem.